Everyone needs a good coffee cake recipe. This is mine. 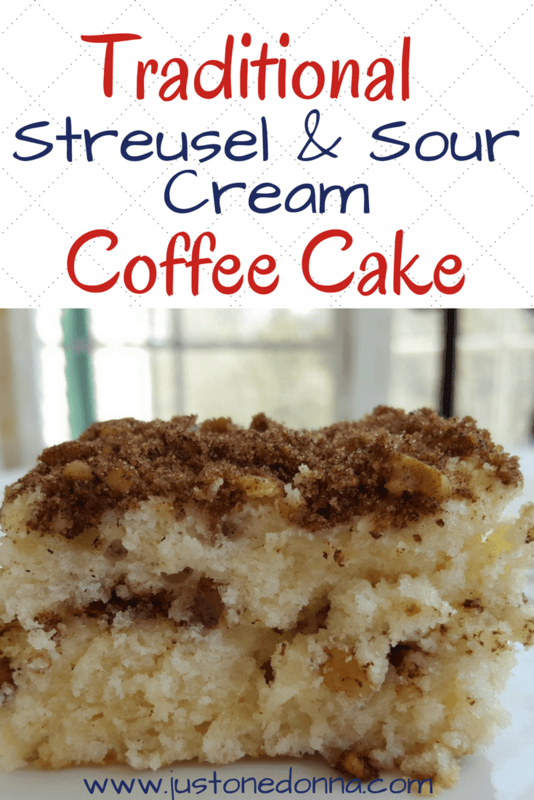 This is a quick and easy coffee cake for you to whip up in the morning to serve as a sweet component of your breakfast or brunch. It's the traditional cake I think about when I when I hear "coffee cake". 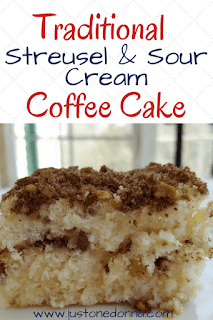 Make this coffee cake in a 9x9 inch cake pan. I like to cut the cake into generous three-inch square portions. 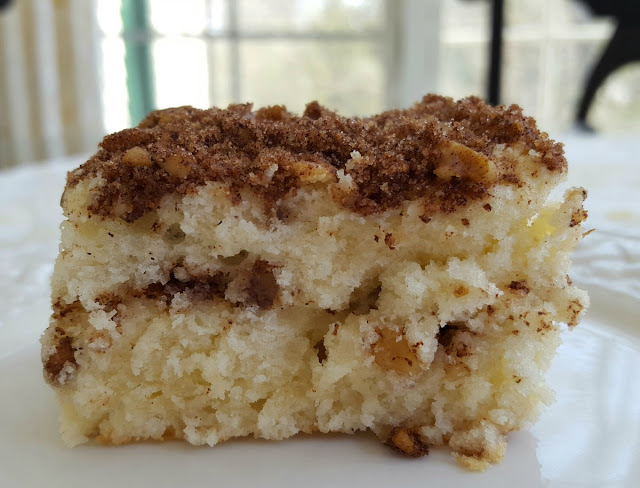 No one wants a skimpy serving of coffee cake! The cake is tender, with just the right amount of sweetness. I like to make the streusel filling and topping with light brown sugar, which adds a little deeper flavor than you'll get with granulated sugar. I use chopped walnuts in the streusel that I chop very fine. I love the added texture from the nuts, but I prefer them to be small little bits. You can make this cake and freeze individual portions for a grab-and-go-breakfast. There's no need to pay the high prices charged in the coffee shop for a piece of cake. Just wrap each portion individually in plastic wrap and then place them in a zip-topped bag in your freezer. Preheat your oven to 350 degrees F. Grease a 9x9 inch baking pan. Mix the flour, baking powder, salt, and baking soda together in a medium bowl. In a separate bowl, beat the sugar and butter together until well combined. Add the eggs and beat to combine. Add the flour mixture and the sour cream to the mixture, alternating the flour and sour cream. Mix to combine well. Mix the streusel ingredients together in a small bowl. Spread half of the cake batter in the baking pan. Top the batter with half of the streusel mixture. Spread the rest of the batter over the streusel layer. Top with the remaining streusel. Bake the cake on the center rack of your oven for approximately 35 minutes. The coffee cake is done when a tester inserted in the center comes out clean. You may serve the cake warm or at room temperature. Thanks for sharing this recipe on Facebook, Pinterest, Twitter, and Yum! I appreciate your shares. Very easy to make. Just made it and it's in the oven. sounds absolutely delicioux !! My problem, I have evry other size pan but a 9x9. Can I use another size? Thank you. Of course you can use another size pan. You’ll just need to adjust your bake time. Good luck.